Hello guys, today I will be sharing with you a way to enable MTN 100% Data Double Bonus On Any Phone. 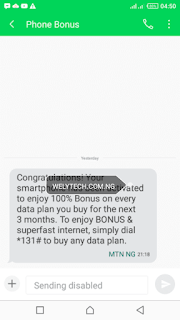 In below procedures to Activate MTN 100% Data Double Bonus On Any Phone does not require changing your phone IMEI. 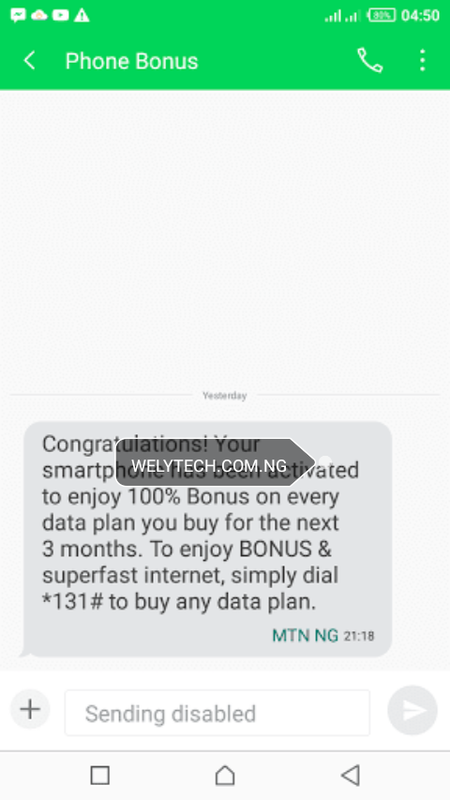 Many people have been complaining that 100% double data on MTN have stopped that is why I decided to help those finding it difficult to enjoy this cheat or Promo. After activating MTN double data bonus you need a data plan to enjoy it. Goto Message and send PROMO to 131 . You’ll receive a push SMS saying “ Thank you for subscribing for device bundle. Reply 1 to accept or 2 to reject ". Kindly reply 1 and then you’ll get a thank you confirmation. After this, you can then subscribe for any plan you want and it'll be doubled. For you to confirm if MTN 100% Double data is truly active on your device has been activated for the 100% double data bonus, kindly subscribe for a daily plan before going for any bigger plans (just to be on the safer side). Dial *131*1# to subscribe for a daily plan. After that, sms 2 to 131 . You should see Daily: 50MB and Device Bonus: 50MB. After confirmation, you can then subscribe to a bigger plan. stay Tuned for airtel data doubling. Use the comment box, have your say.